The horns arrived without damage. I hooked up a quick 2 way crossover last night and gave them a listen. I need to tweek the crossover a bit and then I will give my impressions. The new RCA cables fit so tightly that they pulled one of the input grouds right off my Adcom amplifier when I disconnected them. I will forward the measurement files for both horns to Giskard and we can start start tweaking crossover designs. I have an idea for fixing the mounting baffle for the horns but I have to put that off until Sunday. In comparison to the Adcoms, by HK receiver has a lot of background noise. It is not objectionable with low sensitivity speakers, but when trying to drive the supertweeters it is unmistakable. I did some more in depth auditioning of the 1500AL and 435Be, as a 2 way with a crossover at 800Hz yesterday afternoon. They sounded fantastic. 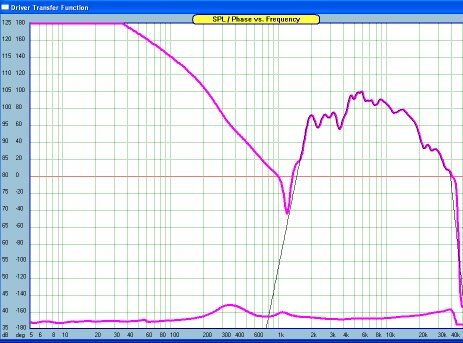 The graphs show that the 435Be rolls off above 13kHz, but I could get more extension by decreasing system sensitivity. I wish I had a 4430 to compare it to. I have a 2234H and 2426H, but no 2344, maybe someone could fly out with a pair and we could compare. When I hooked up all the drivers with the modeled the S9800 crossover you could definitely tell when the supertweeter was turned on and off. 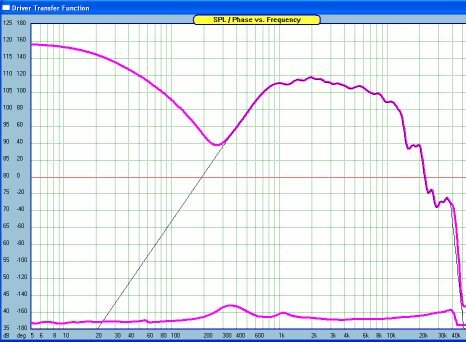 There is minimal acoustical difference in the response curves between the wood and sonoglass horns. I have to run the impedence curves again though with the new measurement system to see if those are the same. I will get to that on Sunday morning, but I'll be at work until then. On Monday I'll set up the MTM stacks and post lots of measurements for everyone to see. My new computer with the Antec Sonata case is much quieter than my old system, but after hauling it around I wish I would have spent a little more for an aluminum case. My polystyrene baffle inserts, to allow mounting of the supertweeter in the MTM array, are really acoustically and aesthetically challenged so I need to do something new. I need equally sized pieces on the top and bottom of the midhorn to center it in the baffle between the woofers, and then it has to be cut out on top to allow the supertweeter to slide in above the midhorn. My plan is to clamp a piece of MDF to the wood horn, cut the contour with my router and laminate trimmer bit, and make a stack big enough to raise the horn on the bottom and house the supertweeter on top. If anyone has some quicker and easier ideas let me know. 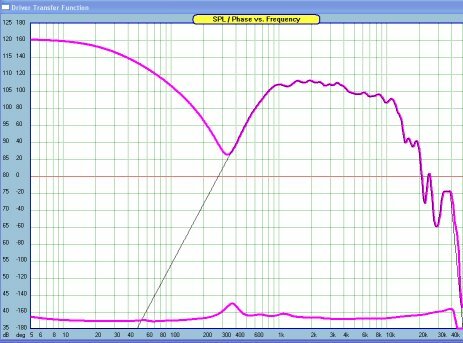 New measurements taken at 96kHz sampling rate allowed me to obtain resolution to 40kHz. Here are some screen captures of driver measurements. The woofer was measured in the sealed cabinet with the center 1M above the floor. All measurements were obtained at 1M on the axis of the driver being measured. The amplifier and sound card levels were set first to obtain the reference level of 94dB at 1 meter for the 1500AL. The pictures show the amplitude and impedance. I made an error in merging my near and far field response for this driver, but the response above 400Hz is accurate. Here is the 435Be measured on the wood horn from Widget. Here is the plot of the other 435Be on the Sonoglass horn from Giskard. You will notice that the response is nearly identical. I measured one right after the other and the plots lined up almost perfectly. This shows that Widget did a great job of reproducing the horn and the drivers have very good unit-to-unit consistency. Here is the 045Be sitting on top of the wood H9800 horn with the faceplate flush with the front of the horn. The high frequencies drop off more quickly off axis. 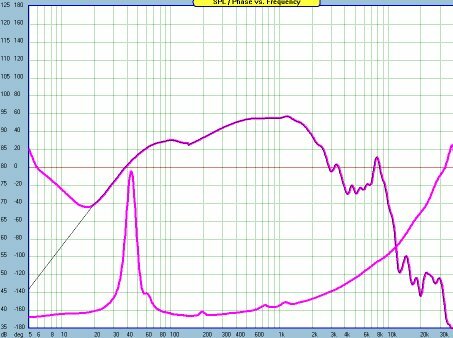 The JBL response graph that Giskard posted for this driver shows additional extension beyond 40kHz that my system is incapable of resolving.